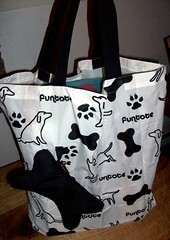 Thank you to everyone who entered to win a Funtote Bone Carry-Me Eco Bag! Congratulations to Kathy! Please get in touch with your snail mail address so I can send this cute bag off to you for your next trip to the dog park (yes, we'll all want to see photos)!!! Congratulations to Kathy. That is a great bag, enjoy it. Congrachulashunz tu Kathy - that iza super tote - our mom iz gonna b soooooo mad she missed that giveaway. Congrats, Kathy! Enjoy your new tote. Yes, congratulations to Kathy. I love that bag... Does it come in kitty, too? Congratulations from one Kathy to another :). I won! Exciting! I'm going to love this tote!